Step right up, folks! Watch the magical nephew perform! Mouse over the picture to watch him change from a robust young man into a concerned, scrawny chicken! It will amaze and astound you! Happy Birthday to you, Matthew! Dang. He’s cute. Happy Birthday Matthew! Happy Birthday Matthew! You. Are. Adorable!! 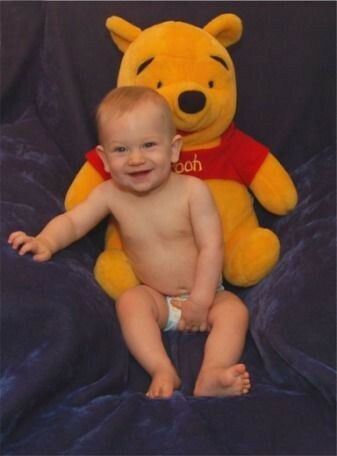 Actually, I just uploaded his one-year old photo with Pooh to my blog. Click on “Mark’s Site” in the Friends Blog-roll. Thanks, sis, for this wonderfully surprising post!!! You’re quite welcome! I’m off to see your photos…..